The crocodile ice fish or white-blooded fish are a family of percifrom fish found in the cold waters around Antarctica and southern South America. Water temperature can drop to -1.9 °C (the freezing point of seawater) in the Antarctic sea but stays rather constant. 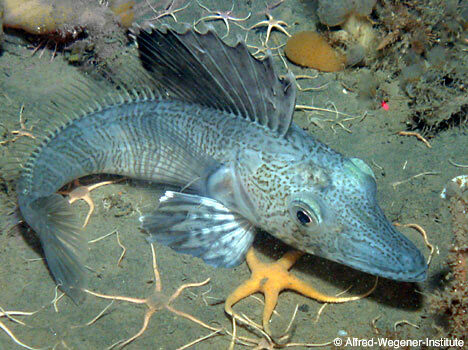 There are about 25 currently recognized species of crocodile ice fish. They feed on Krill, copepods, and other fish. Icefish reach total length of 25-75 cm. Found only in the Antarctic, the blackfin icefish occurs around Bouvet Island and in the Scotia Sea around South Georgia and the South Sandwich Islands, the South Orkney Islands and the South Shetland Islands. It also occurs in the northern part of the Antarctic Peninsula.